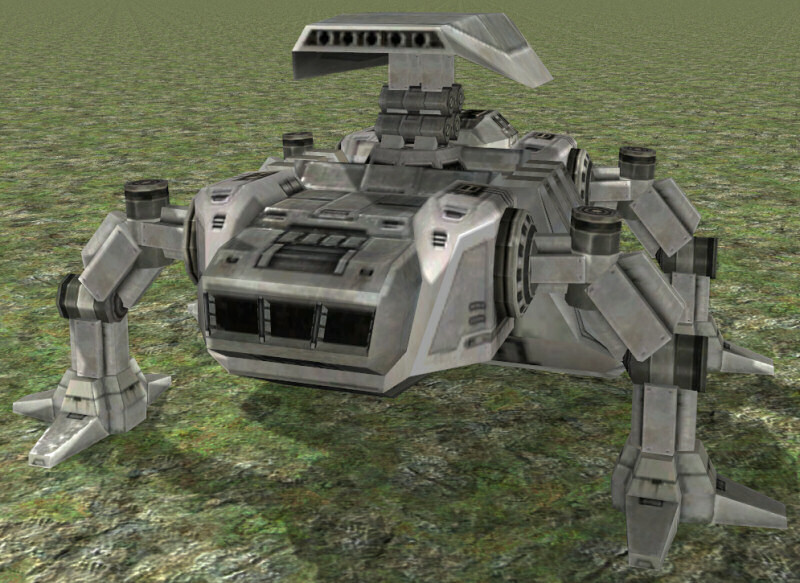 We introduce the All Terrain Anti-Aircraft (AT-AA), the quick moving, four-legged, strong firepower mobile anti-aircraft walker used by the Galactic Empire. 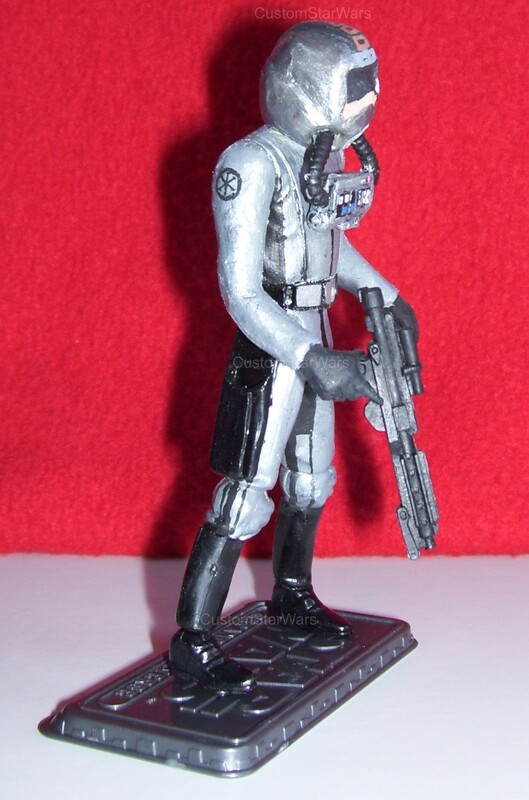 If an AT-AA has appeared on the scopes of Alliance speeder and bomber pilots, they were terrified, and bathed in icecold sweat. The Imperial All Terrain Anti Aircraft walker had prestige, and was so abhorrent, that was enough to deter Rebel forces from employing starfighters in ground-based attacks. The Rothana Heavy Engineering started the development of the AT-AA antiair platforms during the Clone Wars, but the design began mass production in the early days of the Galactic Empire. The four-legged assault craft has a heavy flak pod turret, (or more often turrets) mounted on its back. The multi-ordnance pods ruled the sky with the huge amount of homing missiles fired up with a deadly accuracy, which AT-AA missiles and charges were capable of shredding through starfighter armor or disrupting delicate aviation electronics, depending on the projectile type. The AT-AA walker also carried complex electronic counter measure devices that can scramble missile guidance systems, and with this this great AT-AA was able to defend itself, or at least to lower the risk of incoming missile from above. But the AT-AA was helpless against any ground vehicles, due to the complete lack of defensive weaponry! For this reason, AT-AAs are rarely deployed alone. 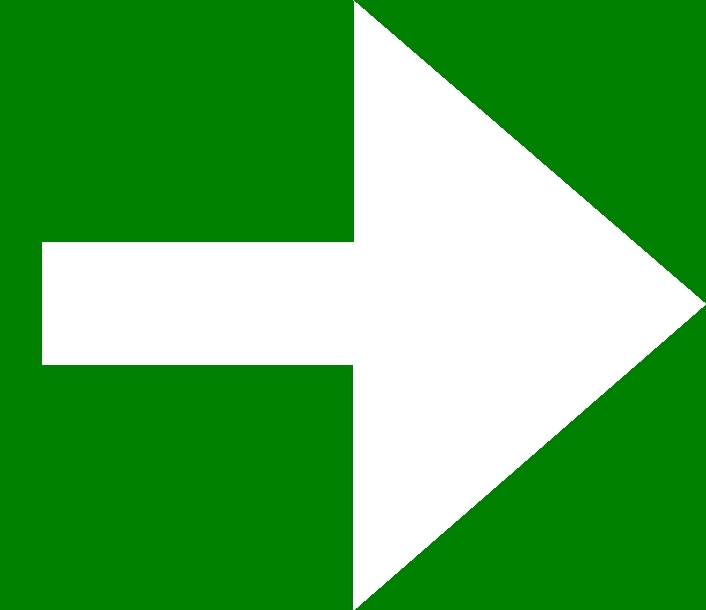 Since the AT-AA relied heavily on escorting vehicles it was never deployed all alone on the battlefield. 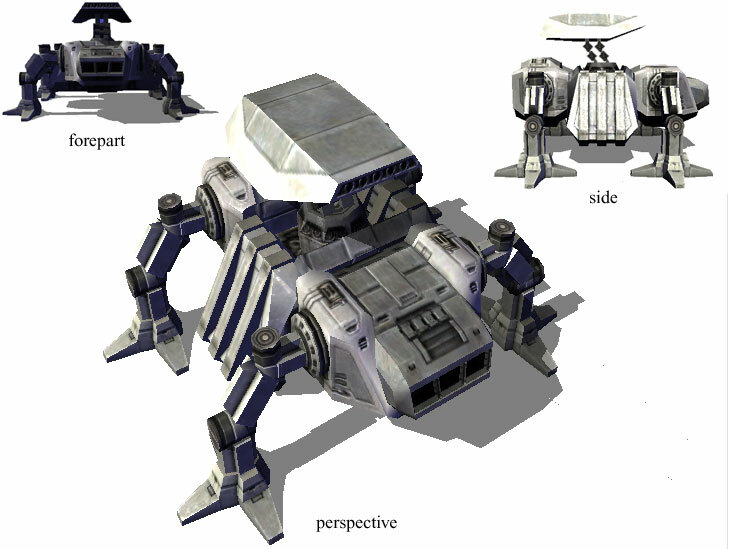 The Empire had the AT-AA developed and built with a low profile so the AT-AA could hide amongst the taller imperial walkers, which made them harder targets for enemy units. The Galactic Empire preferred the large, powerful, frightful vehicles, so this sort of short, and stealthy vehicle was unconventional in other Imperial army. On most models, the only weapon was a powerful rotated flak pod turret, capable of blanketing the sky with deadly plasma charges, there was no mercy. During the Battle of Kalaan, such AT-AA batteries protected the armored columns of imperial vehicles, and these AT-AAs guarded the air till the dozens of barges and troop transports brought airborne troopers, and vehicles for the offensive. 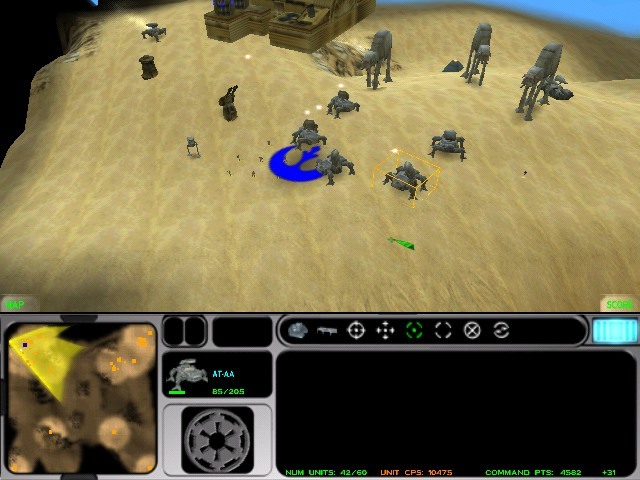 Then they escorted them into the city, basically destroying all of the arriving defending Alliance airspeeders almost without a lost AT-AA, as it was seen in the game Star Wars: Force Commander. Other AT-AA versions could be equipped with rocket-launching tubes. The prototype AT-AA was equipped with one rocket launcher, but the fully developed AT-AA version had three rocket-launching tubes. They launched homing missiles so quickly, that the rockets could darken the sky. In this screenshot you can see how much rockets were left - so many rockets were fired against a Rebel Alliance snowspeeder, that after it was detonated, there were remaining plenty of rockets in the air. What a waste, you may think, but never mind, the next huge amount of rockets are coming soon for the next rebel fighter, who is just realized that his fellow pilot friend is no more. 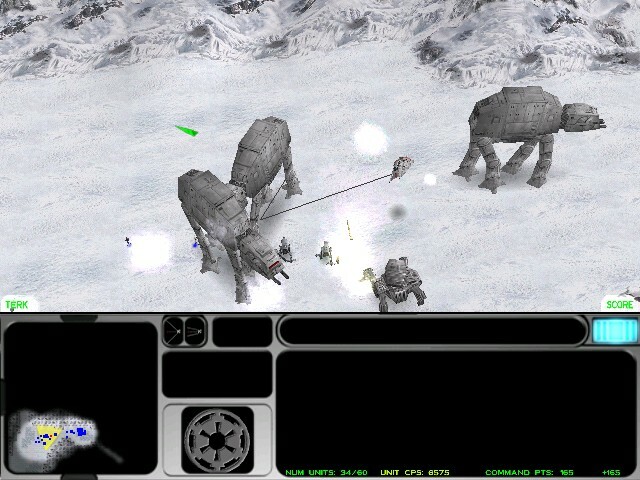 In Star Wars: Galactic Battlegrounds we can see these AT-AA walkers, and we can try them, too, but only if we chose the Galactic Empire in the gamestart. 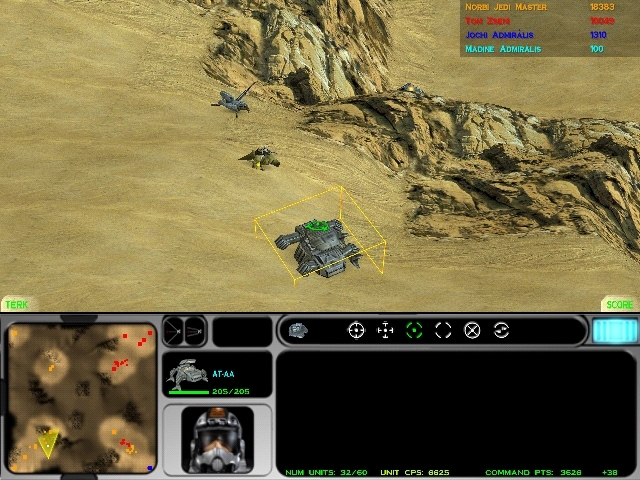 The third appearance was in the game Star Wars: Empire at War, but that was not new, since the sensational Star Wars: Force Commander, and the super Star Wars: Galactic Battlegrounds had already maximized the benefits of this AT-AA project, so EaW decided to apply the well-known conceptions, but in a newer outfit. And we must admit looking at these pictures, they were successful, the AT-AA became beautiful, the graphic is great. EaW is a newer game, it was expected like that, and really, these anti aircrafts are really nice, and respectable indeed. 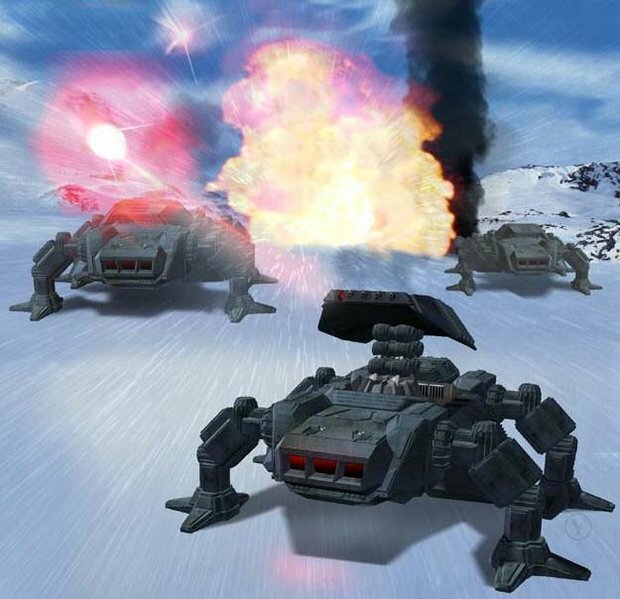 This is the only Imperial siege weapon that the Expanded Universe gave for the fans, and the only one, that appeared in all three of the major Star Wars Real-time strategy games. 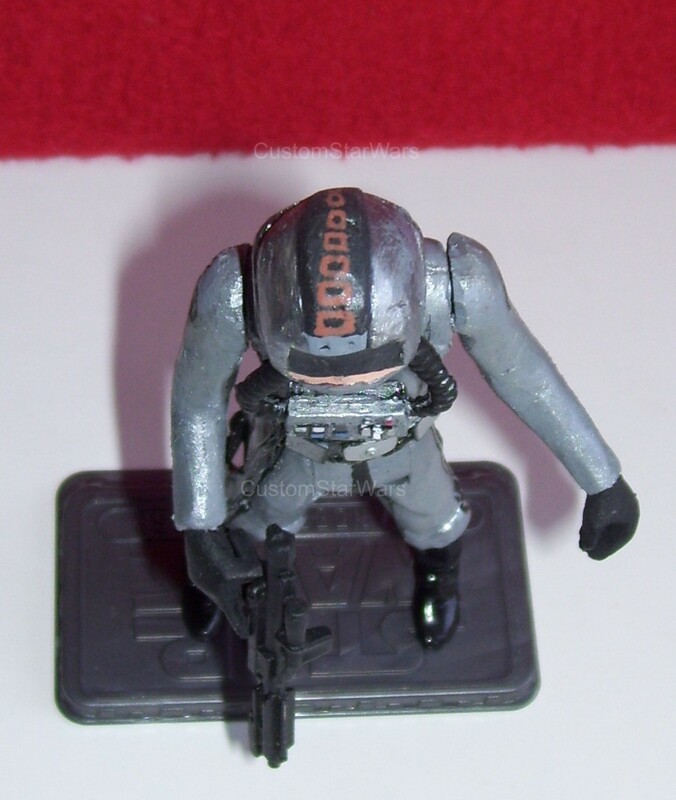 The troopers aboard (an AT-AA driver and the crew) wore a grey fireproof overall, and an open helmet. However they have a healing mask on their face under the helmet, which supports the fresh oxygen. They have a darkened eye visor, since the enemy pilots often attack from above with the Sun behind them, so those, who stare at them, will be blinded by the sunshine. While playing the game Star Wars: Force Commander you can apply the AT-AA anti air walkers in almost all combat situations perfectly. 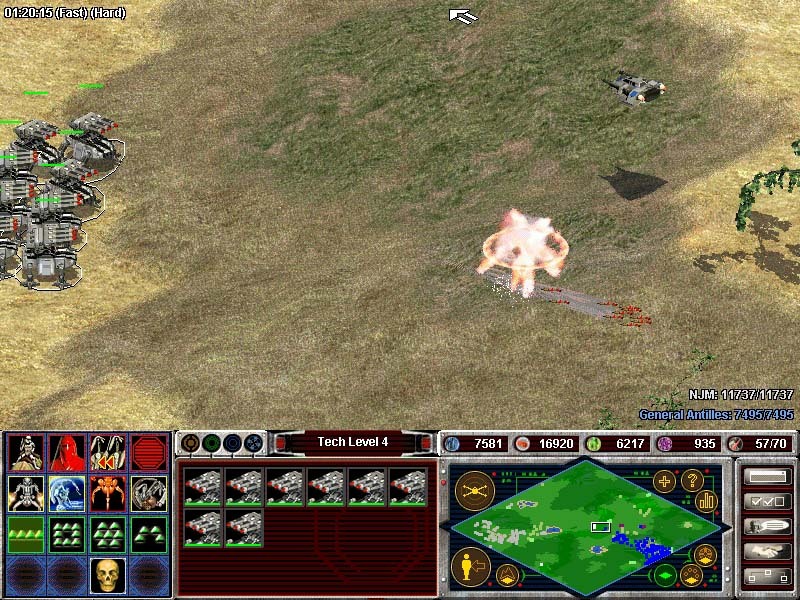 The AI likes to put them on the lead of a convoy because they are cheap, (100 command point) they are perfect for shields, I mean since they appear first from the Fog of War, they often get the shots first, and the other, more expensive units can avoid damages back in the row. 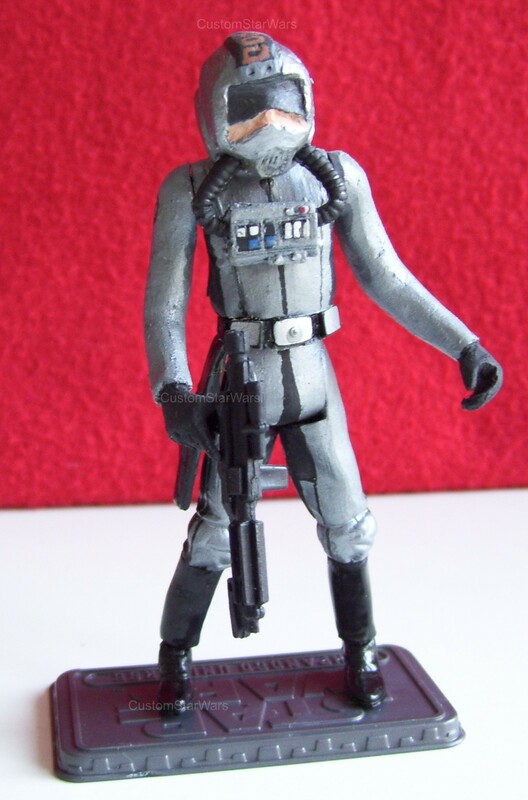 For example if a rebel Hover proton tank fires its torpedoes towards an AA walker, to get rid of them, and to be able to send the rebel fighters against the walkers, they wont have more torpedos to fire against the strong AT-AT-s, and AT-ST-s, who will destroy them with their great firepower for sure! 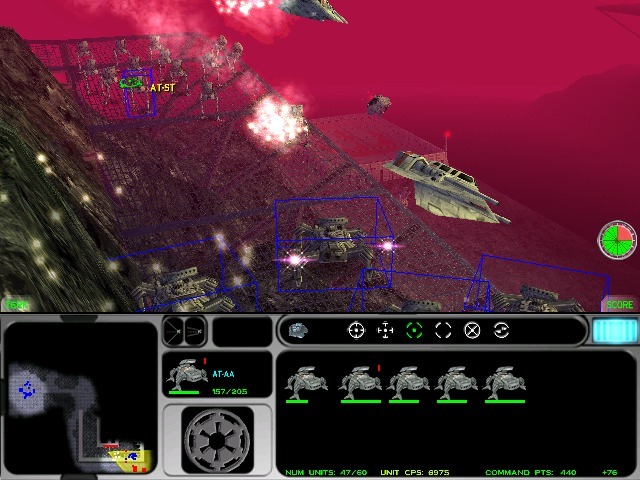 In addition the imperials still have Tie fighters to deploy quickly to aid the armored vehicles, if the rebel fighters decide to towcabel the walkers, or to bomb them with Y-wings. IF YOU CLICK on an AT-AA, you'll hear the following reporting ins, and voices! 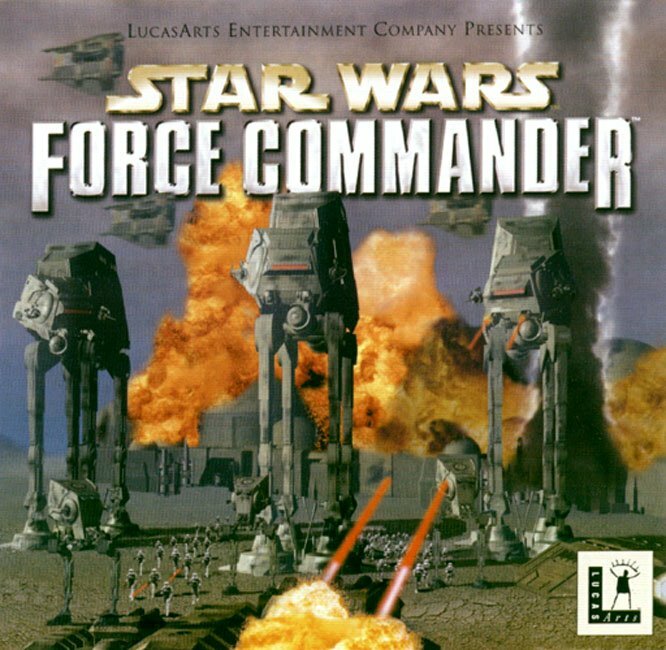 Listen to the original sounds of the Force Commander AT-AA driver in MP3! Ready to serve the Empire. I got them on my scopes! They won't know what hit them! 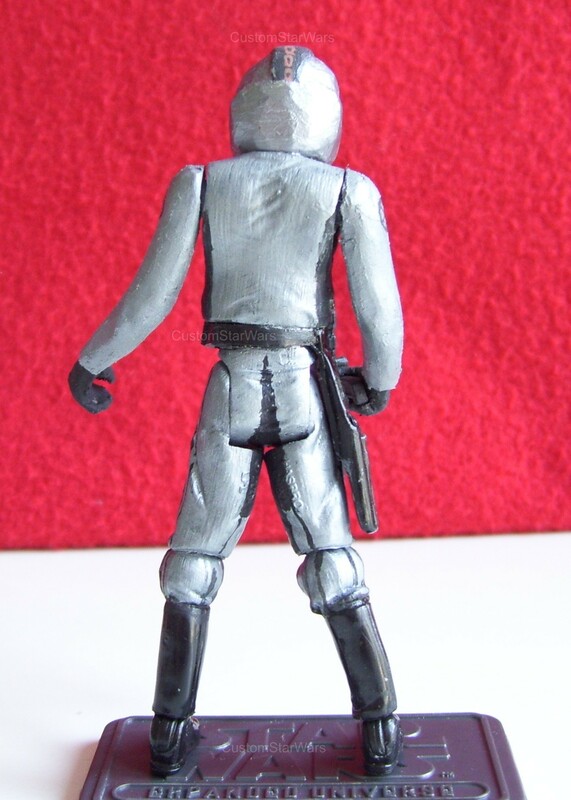 Take a look at my Custom AT-AA driver figure. Thanks for your attention, visit CustomStarWars frequently!